Getting certified is as easy as 1, 2, 3! An open Water Scuba diver certification is good for the rest of your life anywhere in the world. Getting Open Water certified is as easy as 3 steps and can be done in 2 days, or 2 weekends. If you would like to get certified after reviewing the information below. Contact New England Dive 203.284.1880 to schedule your class, today! This E-Learning can be bought at the store in person or over the phone and emailed to you. Open Waters happen typically from May until October (Weather Dependent) and usually happen 2 weekends a month. If you have any further questions, please do not hesitate to email info@NewEnglandDive.Com or call 203.284.1880. 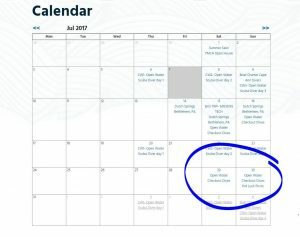 To See our CALENDAR, please use the following link https://www.nedive.com/calendar/ and look for events that say Checkout Dives like the example circled in BLUE below.